I spent a few days on the Outer Banks last week, a gift from a friend who owns a vacation property in Nags Head. Beyond being just a fun place where you can show up pretty much anywhere as you are, the area holds a lot of sentimental value for me. It is the last place I spent a block of time with my brother –the Major, as I call him–before he was admitted to the transplant unit to wait for his new heart. It’s where we planned to return for our first fishing expedition when he got said new heart— one of those all day charters where we could catch fish as big as ourselves and spend hours wrestling it into the boat. 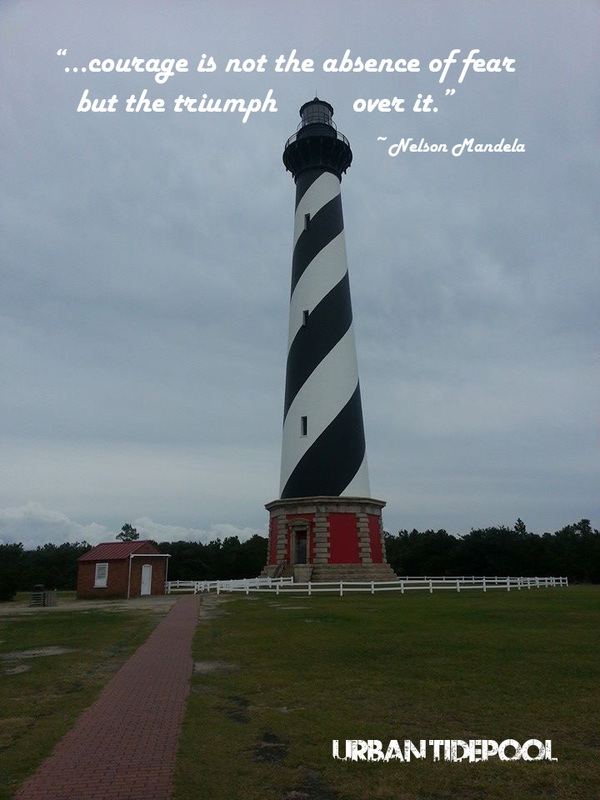 I stood on the grounds of the Cape Hatteras Lighthouse on Thursday, feeling at once a curious combination of having come home to the candy-cane striped landmark and longing to go home to a place that ceased to exist when the Major didn’t survive long enough to receive his new heart. That lighthouse survived. In fact, that lighthouse was relocated, in its entirety, so that it could. Think about it. That whole structure was MOVED. All 208 feet of it. In the summer of 1999, after about a decade of planning, engineers removed the front steps from the structure, ran tracks across the grounds, jacked up the lighthouse, and started the move along those tracks. Well, I’m sure it was more complicated than that, but not being an engineer, I’ll give you the tourist’s take on the move! It took 23 days to move the entire lighthouse 2900 feet in 5 foot increments, the tallest brick structure ever moved in history. We all have them, you know. Lighthouses, I mean. Those structures in our lives that warn us of danger, warn of us of the Diamond Shoals just beyond the shoreline. Don’t go beyond this point—this is not safe. Observing that rule keeps us safe…until just like in Cape Hatteras, the sand begins to erode, threatening to topple the structure and destroy what we’ve built our lives around. And then, just like in Cape Hatteras, ya gotta get your hands around that 5000-ton lighthouse and ya gotta move it. My lighthouse was and is the writing of Urban Tidepool. When I started writing, in the summer of 2011, I told no one. Only my spouse knew I was putting some of my history into writing. As I wrote, I was convinced that if I ever managed to get published, that I should never do that under my real name. I had a pen name all picked out. Fear drove the decision. My history could never be allowed to associate with the person I’ve become. Too much risk to my job…too much risk to my life. Except for one thing. That’s my story. That IS what happened. Those things ARE what I saw and what I lived with. They’re mine. If I take away any of those stories, would I be the same “me” that I am now? Those were not great experiences. Some of them were awful experiences. But all of those combine to make me the “me” that I am, and most days, I like this me. I went back to the drawing board on the pen name. Maybe I didn’t need one. As I wrote, I often felt like I was slogging through emotional wet cement. I wrote the chapters not in chronological order as I supposed most books were written. I wrote as memories came and pulled other memories up. I’d sit with my laptop, the scene running in my head, trying to capture the events and the words of what played out on those days so many years ago, and I’d be IN that scene. I’d be there. I was sitting on the couch or the dining room table of my home, sobbing, and completely unaware that I was sobbing as I wrote what I remembered. I dredged up things I hadn’t thought about in 40 years. The engineers removed the stairs from the front of the Cape Hatteras Lighthouse. My usual routine was to write a chapter, tear it open, get it down, then read it to my spouse before I sent it out to my reading team. I’d read with a foot in both worlds, being here on my couch and there in 1979 or 1982, repeating the words that were said to me, or that I had said, reliving humiliation and injury and loss. The engineers ran tracks across the ground. I’d walked around for more than twenty years believing that my career was merely a house of cards and as soon as people really knew who I was, really KNEW where I had come from, (really knew I hit that nun that one day), that my career would collapse. People would not wish to associate with someone who’d done such things. The engineers jacked up the lighthouse. It tore everything open, this writing. I came nose to nose with stories I’ve wanted not to think about since I was eight years old—not that I really WANTED to think about them back then. I came nose to nose with the things I could see now as an adult…pick up in my hands and turn all around and see…and think, “Wow, that was really f*cked up.” And I was going to put that out there for people to know about. Not because I think I have tons of answers for how we can all move forward through such circumstances (because I don’t) but to raise questions about how we can do better what we do for kids in our careers. My lighthouse was standing at the edge of the beach. Could telling my story offer anything to improve what social workers and teachers are trained to do? Could it generate conversation among other folks who are not social workers and teachers, but maybe do something else…like coach soccer on Saturday morning or tutor kids who need a little extra help in one area of their schooling? I thought maybe it could. I kept writing. Mother’s death. Family violence. Addiction. Animal torture. Father’s death. Homelessness. High risk behavior. Terror. Rage. Devastation. Friends. Connection. Hope. Breaking open. Survival. The engineers started to move an entire lighthouse along steel mats, 126 feet per day, in 5 foot increments. I knew in the process of writing that my healing from what happened when I was a kid was still underway. I had put those stories away for a long time, believed in the lighthouse and never went past that point, and finally the shoreline was starting to erode. I didn’t know that there would be a healing process then from writing about it or how it would affect the people around me as they navigate this process with me. Sometimes ya gotta get your hands around that 5000-ton lighthouse and ya gotta move it. It took 23 days and the engineers set the lighthouse down in its new location fully intact, safely away from the eroding shoreline. It’s taking longer than 23 days to move my lighthouse. The engineers working with me are an admirable group of people with seemingly endless patience, just as deserving of an award as the engineers who moved the Cape Hatteras structure. Allowing my lighthouse to stand on an eroding beach wasn’t the best choice I could have made. Sometimes the only way to change that is to be jacked up, nudged to a new location and set down on a new foundation. Lighthouses. We all have ‘em. Thanks for being willing to share it with me, Holly! This sure causes one to think about oneself and their own life but I guess that is what you were hoping for. I just finished your book and I am still digesting all that there is to feel and learn. You are a wonderful person! Thank you, Deb! Let’s find a time to talk more–I’m sure you’ll have some great feedback for me! Thank you for sharing your tragedies and triumphs. I know it isn’t easy. I’m only sorry I didn’t see it then. I would love to read your book, maybe you can send me a copy. I think it would help me understand things that I really can’t let go of. You have turned out to be a truly accomplished person despite all of your tragedies! Thank you, Karen! I’ll email you!